Yes, this salt is pink. No, it doesn't come from the Himalayans. Yes, it comes from Long Island! 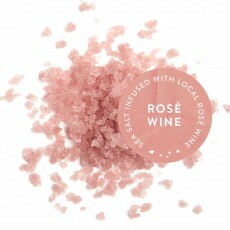 Yes, we really add bottles and bottles of a local Long Island Rosé Wine to the evaporating brine to give this finishing salt its brilliant pink color and a touch of fruitiness. This blend has a strikingly vibrant pink color and a subtly sweet flavor. We use this blend extensively on savory fish courses, crudo, fruit and a wide range of dessert items. There's not an overwhelming rosé flavor in our wine glass, so please don't expect miracles of fruity flavor from a couple of grains. This blend will, however, make your dishes taste, look and feel better.